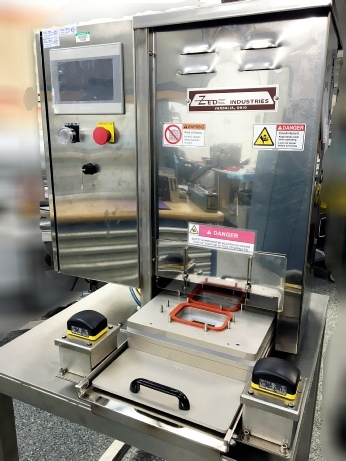 Validatable tray heat sealer designed for aseptic medical packaging applications and critical sterile packaging. Medical tray validatable blister heat sealer designed specifically for aseptic packaging applications. For example, allograph tissue packaging using thermoform trays; and other critical medical packaging applications. This unit is a single sided shuttle type sealer which is designed for washdown with sterilants and disinfectants. • Full washdown capability with serilants and disinfectants. Aseptic packaging with validatable medical tray heat sealer. Sealer is designed for ISO Class 4 cleanroom operation. It has wash-down features for critical sterile packaging applications, like allograph tissue packaging and other aseptic fill processes.